The New And Improved Unofficial R65 Forum - Will '85 R80 Brembo caliper fit R65? The New And Improved Unofficial R65 Forum › General Category › BMW Technical Q&A, Primarily R65 › Will '85 R80 Brembo caliper fit R65? Will '85 R80 Brembo caliper fit R65? Would the '85 R80 Brembo caliper fit the '83 R65? They look identical however it doesn't appear part numbers match. Are they actually different? I have the provisions to mount a right hand caliper on my R65 forks and I could use the extra braking power. I assume I'll need the master cylinder and brake lines off the R80 as well. 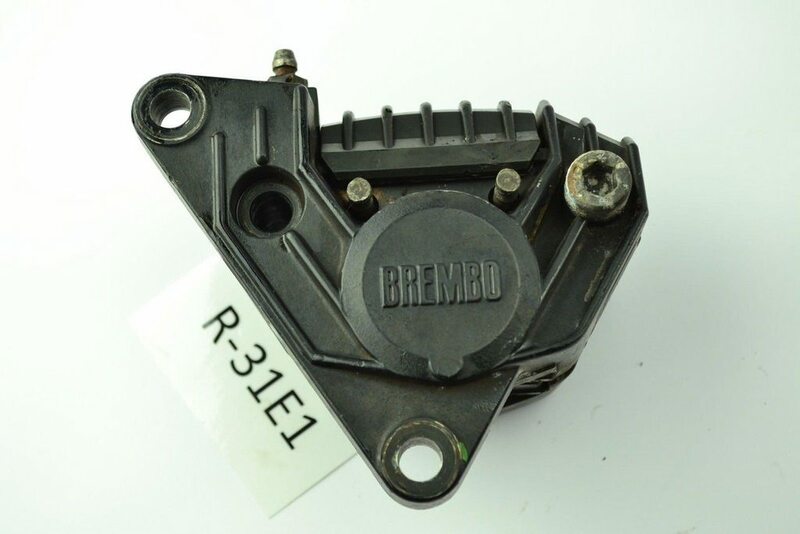 Re: Will '85 R80 Brembo caliper fit R65? Possible bolt hole centers my not be correct for an R65 . On the R65, the right hand caliper has different mounting holes diameter than the left hand side one. It is for a special washer and associated tube to be mounted. These washer are made of different thicknesses and are used to center the caliper above the disc. This way you can adjust the discs position by using washer under them and finish with the special washer on the right hand caliper. Parts number 14 for the caliper and 16 for the discs. P.S. there is not much clearance between the two fork legs so adjusting things properly is paramount. The the OP the answer to your question is "probably not". If the R80 from which the caliper was taken is from a "post 1985 update" machine, i.e. a single rear shock machine then the caliper will NOT fit a twin shock R65. The reason is the relative spacing of the wheel/fork set. The twin shock wheel spacing harks back to the days of spoked wheels, whereas the spacing on the monoshock machines is significantly narrower as it is based on the clearance requirements of the cast wheel. 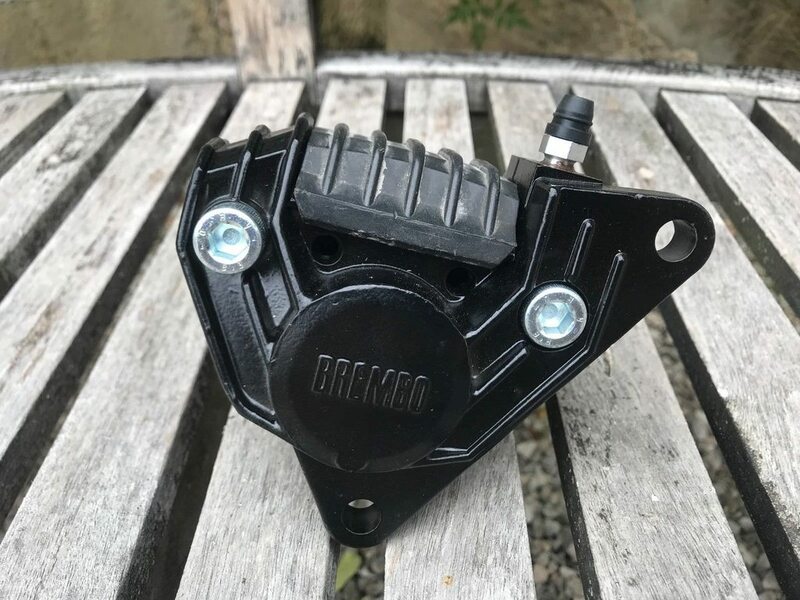 The spacing is why you cannot simply buy a set of Brembos from an early K100 and use those (they can be had from wreckers as low as $AU60 a pair. The monoshock airhead uses the same wheel spacing as the K100 and the brake calipers are identical. Only two of three days ago as I fitted a K100 front end to my R65 I had the left caliper formt he R65 and K100 in my hands and the light finally dawned why you cannot interchange them. I had to dismount the newly fitted K100 Brembos today so I took the opportunity to snap a photo of the LHS K100 edition next to the one that I took off when removing the R65 front end. Have a look at the RHS "distance" of each caliper. That is why you can't just bolt a K100 caliper to a twin-shock R65. As far as I know the monoshock twin-piston Brembos are the same dimensionally as the K100 calipers, although the piston diameter may vary. Tony is correct, the twiin shock and monoshock brake calipers are not interchangeable. In addition to the physical size and mount points, the brake pads are different as well.